Since 1987, Hardman Signs has been designing, fabricating, installing and maintaining the outdoor signs that our service area's businesses and buildings need. Our outdoor signage company provides completely customizable service and start-to-finish assistance from a trained team of signage designers, project managers, site analysts/planning experts, engineers and installation/maintenance/repair technicians. In addition to designing and fabricating traditional and non-illuminated outdoor signs, we create digital, LED and solar signs. With locations in Houston, Austin and Atlanta, we're the exterior signs company that the Southwest depends upon for fast and efficient service. Read on to learn more about our exterior signage company. Working with Hardman Signs ensures that your outdoor signs will fulfill both your aesthetic and commercial requirements. One of our designers will help fine-tune your outdoor signage design and our expert engineering staff - working with the latest and best in equipment and materials - will neatly and efficiently fabricate your exterior signs. 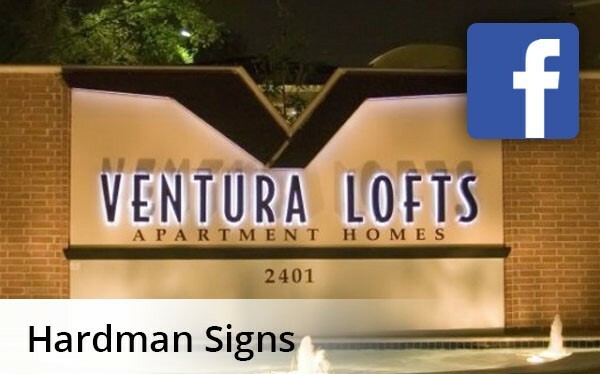 Trained Hardman Signs project managers will oversee the fabrication process to ensure that it's completed within schedule and according to your set budget, and our installation/maintenance staff will erect and repair your exterior signage. With locations in three major Southern cities, we're the Houston outdoor signs, Austin outdoor signage and Atlanta exterior signs company with the amenities you're looking for. To learn more about Hardman Signs and the outdoor signs that we manufacture, fill out our no-obligation quote form or call us today.